In Depression-era south Texas, a young Mexican-American woman broke tradition when she stood up for oppressed workers in her community and made an important contribution to the fight for social justice. Tenayuca was born in 1916 to a large family in San Antonio. Her grandfather, Francisco Zepeda, helped her read newspapers as a young girl and often took her to San Antonio’s Plaza del Zacate, a gathering spot where community leaders shared news and talked about politics. The discussions instilled in her a lifelong passion for learning and social justice. By 15, she was a gifted, well-read high school student, who could debate the issues of day in English and Spanish. Most families in her community struggled to survive on low-wage jobs, and they faced racial and gender discrimination. Many were farm workers who were exempt from coverage by the National Labor Relations Act of 1935, which granted union organizing rights to industrial workers. Those who chose to stand up for better wages faced unjust firings, jail, or the threat of having loved ones deported. At age 16, Tenayuca joined a picket line of workers on strike against the Finck Cigar Company in 1933, resulting in her first arrest. After graduating from Brackenridge High School in 1934, she helped organize two branches of the Ladies Garment Workers Union in San Antonio and became a familiar figure in every protest by Hispanic workers in the region — writing leaflets, visiting workers’ homes, and offering encouragement to workers demanding better pay and dignity on the job. Before long, people from her community often sought the young, bilingual woman’s assistance on every-day matters. She became their voice, Tafolla said. In 1937, she helped form the National Workers Alliance (NWA), and became its general secretary. The organization fought for jobs, a minimum wage, the right to strike, and an end to beatings of Latinos by border patrol agents — whether they were “illegal” or not. Before long, the organization had 10 chapters. In the 1930s, San Antonio’s 400 shelling plants prepared 50 percent of the nation’s pecans for market. While the nut-cracking process had been largely mechanized, most producers found it profitable to exploit Mexican-American women to do the final nutmeat-picking work by hand instead of purchasing additional machinery. Many of them worked in crowded, poorly lit, poorly ventilated buildings. The cramped, dusty working conditions were blamed for a high rate of tuberculosis among the workers, many of whom also lived in crowded housing. In early 1938, the companies sought to further increase their profits by cutting the workers’ pay, from six or seven cents per pound to as little as three cents. Approximately 12,000 women walked off the job on Jan. 31, 1938, and unanimously elected Tenayuca the strike leader. “These people were already starving, and they were being asked to live on half,” Tafolla said. Nonetheless, Tenayuca “had to be an incredibly persuasive person to talk them into a strike,” given the threats they faced for standing up to the owners. “Tenayuca inspired people. She was fearless,” Tafolla said. The workers organized under the International Pecan Shellers Union (IPCU) Local 172, and were soon joined by another 6,000 to 8,000 workers. When Pecan production ground to a halt, the owners fought back: Tenayuca and hundreds of strikers were gassed and arrested by San Antonio police. Some were beaten as well. With the NWA rallying community support, the strike turned into a city-wide uprising of the poorest and most op- pressed people in San Antonio. Thirty-seven days after the strike began, the pecan producers agreed to arbitration. A few weeks later, the workers had won a wage increase to seven or eight cents pound. “What started out as an organization for equal wages turned into a mass movement against starvation, for civil rights, for a minimum-wage law,” Tenayuca recalled in 1987. The strike also marked “the first successful sally in what became the Mexican-American social justice movement,” notes, University of Texas historian Don Carleton. Meanwhile, Tenayuca’s activism had not only won her the enmity of the city’s leaders and pecan producers; she was also persecuted for an association with the Communist Party due to her brief marriage to Homer Brooks, a party leader. 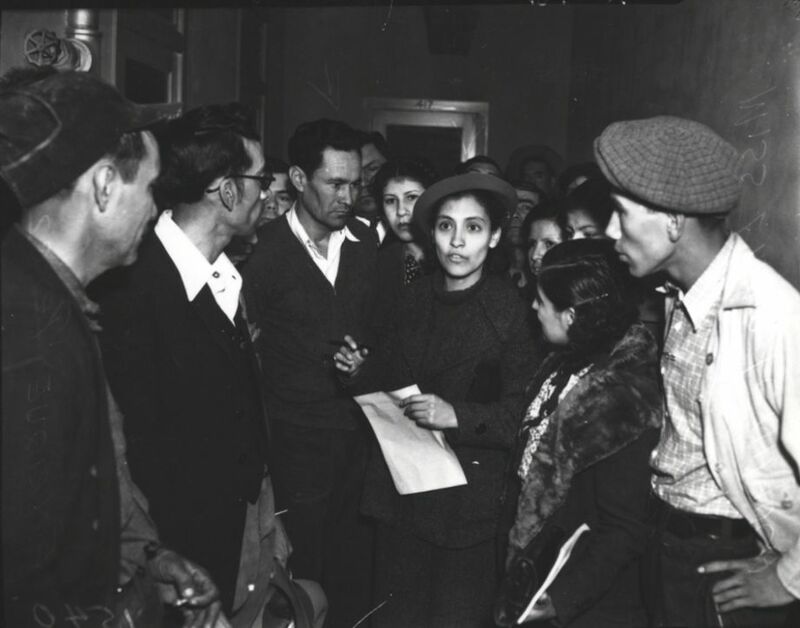 Though Tenayuca had stepped down as a leader of the pecan workers’ strike when she married him, her name was nonetheless in the newspapers every day, and she was arrested several times on trumped up charges. To the establishment “she was the devil incarnate,” Tafolla noted. “She dared to marry a white man. They just hated her. “A friend would tell her, ‘I have to read the paper to find out if you are in or out of jail,’” Tafolla added. The hatred exploded on Aug. 25, 1939, when Ku Klux Klan members and several thousand others stormed San Antonio’s Municipal Auditorium, where Tenayuca was speaking to a gathering of 150 activists who were demanding union rights, a minimum wage, Social Security, and racial equality — goals that a local newspaper derided as a “socialist plot.” The angry mob that had formed outside the building at the newspaper’s urging threw rocks and bricks, and threatened to lynch Tenayuca. She escaped the largest riot ever in San Antonio via a secret passageway. Blacklisted and threatened, Tenayuca moved to Houston and was able to find work under a pseudonym. She later moved to San Francisco, where she earned a college degree in 1952 and became a school teacher. She returned to San Antonio in the late 1960s and taught migrant workers’ children how to read until she retired, in 1982. Tenayuca died in 1999, at 83. Though out of the limelight for many decades, Tenayuca “never lost her passion for social justice and empowerment,” notes her niece, Sharyll Teneyuca, a San Antonio attorney who with Tafolla has written a children’s book, That’s Not Fair! Emma Tenayuca’s Struggle for Justice, published by Wings Press. The two are working on a full-length biography for adults about the trailblazer.